Don't lose time in getting your IT consulting business online, start with the IT Company WordPress theme and easily create a professional online presence for your services. Simply add your own text and photos to this pre-built website template and keep your focus on what you do best. 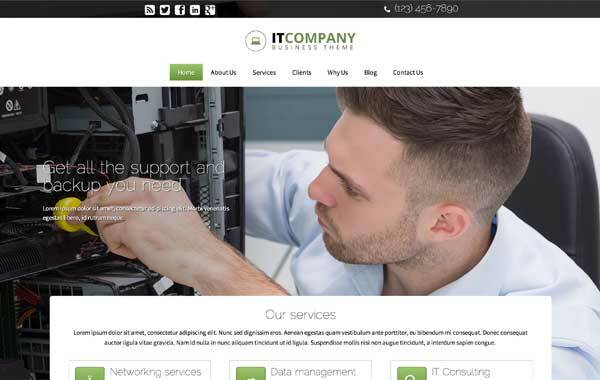 Whether you're just starting up a new IT consulting business or upgrading an outdated website, the IT Company WordPress theme is a smart business solution that saves you time and money. Designed with a clean, accessible look and feel and pages already set up for your services, company profile, client list and more, this pre-built template helps you get your new website online fast. All it takes to get the job done is to fill in your own text and images. The color scheme and page layouts can be easily customized without any coding at all using our visual front-end editing tool and drag and drop widgets. 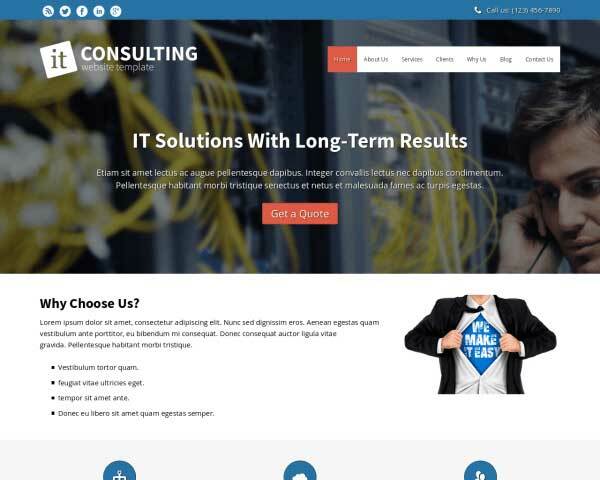 This premium WordPress theme for IT consultants includes useful business features that would normally require additional coding or plugins, like customizable contact forms, integrated social media options, an SEO manager and mobile-optimized design. 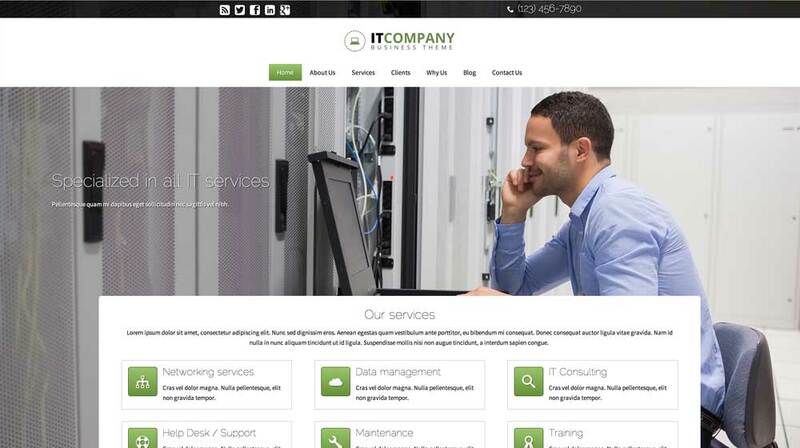 With the IT Company WordPress theme, your website is most than halfway finished right from the start. Build customer engagement with IT Company WordPress Theme. It comes with an attractive blog that can enhance customer relationships. 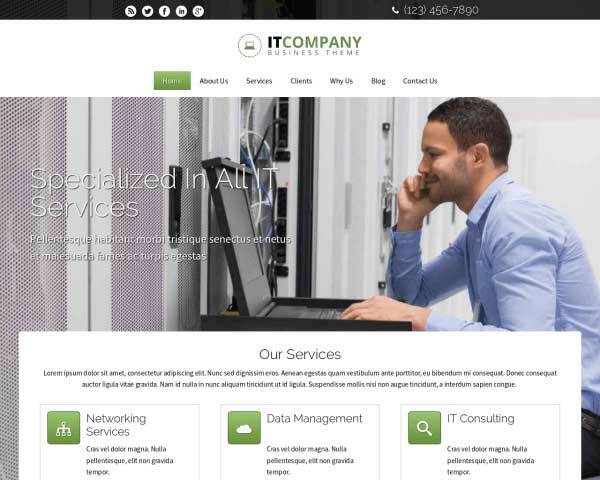 The IT Company WordPress Theme helps you get your software services online fast, saving you valuable time so you can focus on what's important. An important goal for any website is to getting your audience to take action. 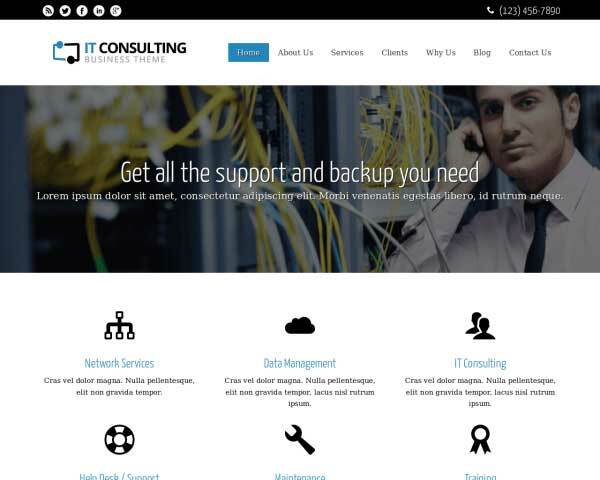 This WordPress theme for it consultants has highlighted spots where you can place your calls-to-action. 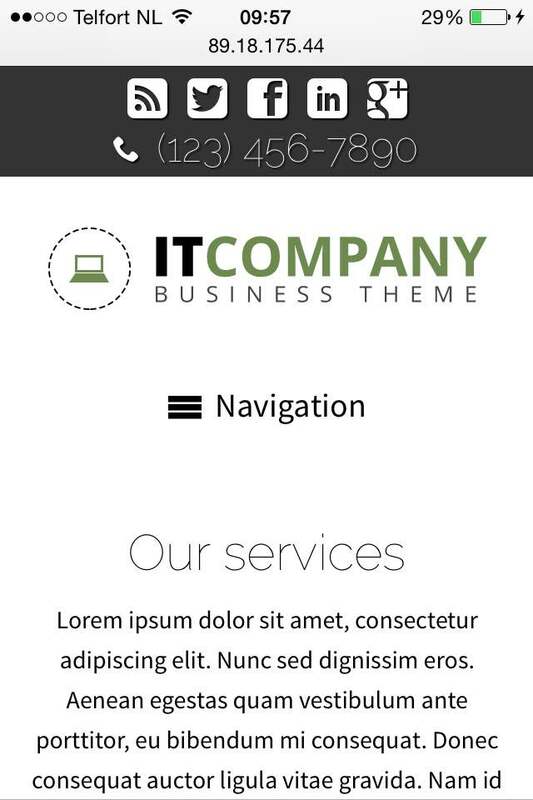 The contact page on the IT Company WordPress Theme makes customer service a breeze by including a your contact form, along with a map and route planner. If you belong to professional associations or have won awards, displaying the corresponding icons is a great way to express your trustworthiness to your clients. A background image slider is a great way to enhance the design of your homepage with an exciting, dynamic element. Just replace the images with your own photos. 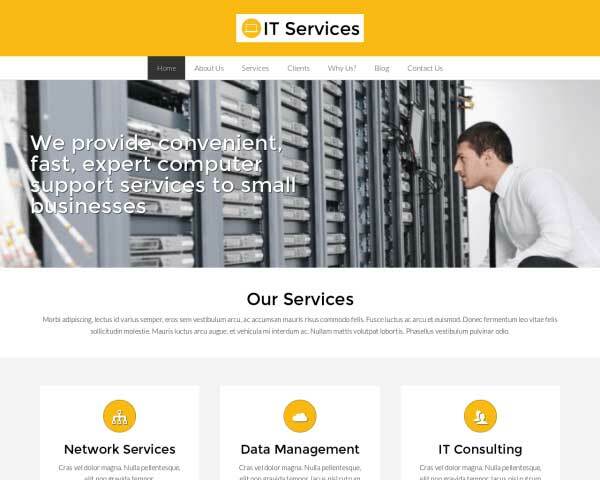 Individual pages are already set up for you to offer detailed information about each of your services on this WordPress theme for it consultants. 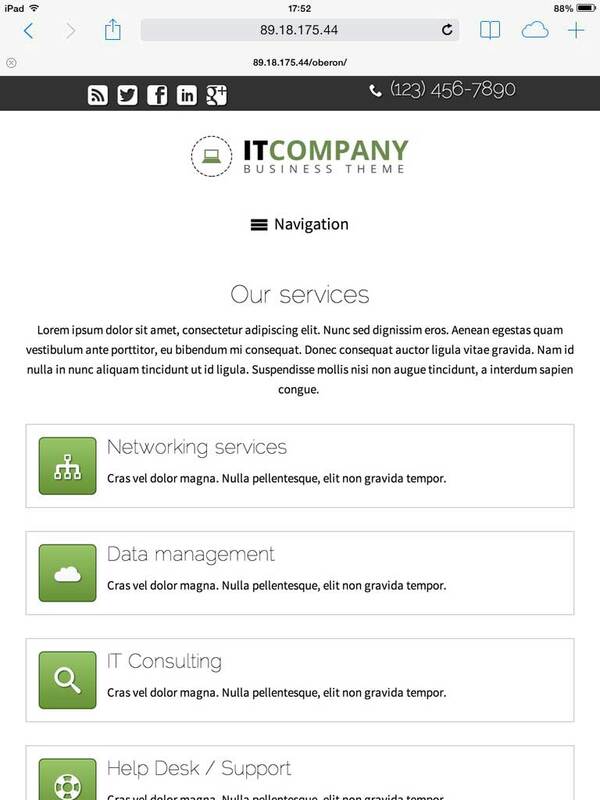 Present visitors with a quick overview of your services on the homepage of the IT Company WordPress Theme, allowing them to navigate directly to that page with one click. This WordPress theme for software companies comes packaged with social media options like sharing and following icons for popular platforms and widgets that display a Twitter feed or Facebook like wall. The IT Company WordPress Theme has a built in about page where you can list your team of experts. This is truly a must have if you want to add some more trust to your site. Prospective clients will expect a state-of-the-art website from an information technology consulting business, so we've built this responsive IT Company WordPress theme to look great on every handheld device. Without any extra coding or plugins required, our mobile-optimized design adjusts the layout of your content to render beautifully on any screen size. Your clients will enjoy the same professional look and user-friendly functionality of the desktop version even when viewing your pages on smartphones and tablets. Mobile visitors can simply tap on your phone number to dial or tap your email to open a draft, making it easier than ever for them to get in touch.